My mom has a birthday coming up on Saturday, so I wanted to make her a really special birthday card. She loves having birds come to their feeder outside the kitchen window, and talks about them frequently to me. I have had a stamp set, Every Moment, that is, unfortunately retired now, for awhile, and never used it. One of the images in the set, a bird in cattails, was especially appealing to me. The real reason I purchased the set. So, here was my chance to finally use it and make someone happy. Since American Goldfinches are bright bright yellow (in the summer), I decided to stamp it in Basic Black onto a retired card stock color, Yoyo Yellow. The perfect yellow for a finch. I added a few finchlike characteristics to him and cut him out. 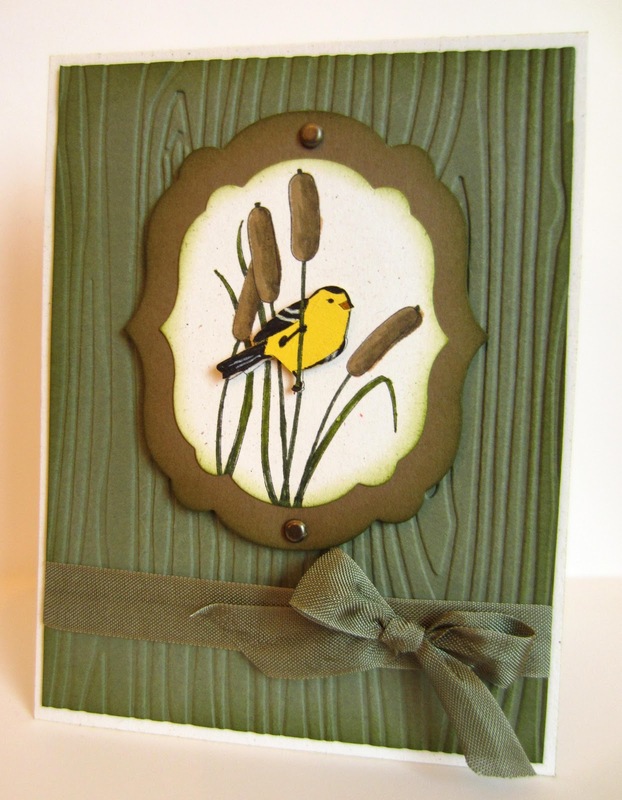 I stamped the image once more on Naturals White card stock and colored in the cattails with Stampin' Write Markers. I then popped the cut-out finch over the stamped one with a few pieces of Stampin' Dimensionals. I framed the finished piece with one of the Labels Collection Framelits diecut in my Big Shot, then used a larger Framelit to create the Soft Suede mat around it. Adding two antiquey brads to the top and bottom of the mat seemed to anchor the image. Stampin' Up! 's new Woodgrain Embossing Folder used with Always Artichoke card stock seemed to be the perfect background for this natural scene. A bow created from Always Artichoke Seam Binding Ribbon added the needed feminine touch. What a precious card, I love the textured paper in the background. Thanks so much for sharing on Super Sweet Saturday. So pretty, I love the background! It looks like it could be a picture as well! Thank you for linking it up to the Saturday SHOW-licious Craft Showcase! I love your card. I love goldfinches too, such a pretty bird. Oh what a sweet tweet card!! your mother (Happy Birthday!! ), will LOVE it! Beautiful job!